Power App: Looking for the perfect starter to share? How can you go wrong with a Seafood Tower of oysters, crab claws, shrimp cocktail, ceviche and lobster tails? Intensely local with novel spins on Lowcountry classics, Hook & Barrel is the kind of place where you can dress down but still impress your out-of-town guests. Think of it as a high-end, Top-Siders-friendly seafood house, without having to drive to Murrells Inlet and beyond. Now you won’t have marsh or inlet views, but the coastal rustic decor could score an HGTV honorable mention with its wood wall features and jellyfish light fixtures. And I’ll give you a heads up right here—prepare yourself for a unisex bathroom experience, with private en suites, of course. There’s outdoor seating on the wraparound porch (and even a porch swing), but you’ll have to swap the moody motion of water for a sidewalk perspective and the steady flow of traffic on Kings Highway. The first big score for the Hook & Barrel dining game is the service. Charming, knowledgeable, perfectly paced and on-point, I can hardly remember another time when I felt captivated by my server. I would go so far as to say that founder Heidi Vukov and her team could have another wildly successful business training waitstaff for the restaurant industry. Big points also go to the crisp lavash and pimento cheese starter that comes to your table on a wooden board cut into the shape of our Palmetto State. The bill of fare here is extensive, and Chef Chris Mulcahy also prepares nightly specials, so we decided to dance around the menu by category. A “Steam Galley Menu” lays out fresh and steamed options of oysters, clams and shrimp with a smattering of surprises like a Lowcountry oyster stew and ceviche for $12 each. Oysters Ala Heidi caught our attention and we were not disappointed with perfectly balanced layers of oyster, greens, and bubbly cheese crust. “Tasty Starts” run the appetizer gamut from a Seafood Tower of oysters, crab claws, shrimp cocktail, ceviche and lobster tail at market price to seasoned waffle fries with hickory bacon, feta cream sauce and spring onions ($12) or a Brie en croute topped by figs, bacon, Worley Lane chevre and a drizzle of blueberry-jalapeno sauce ($14). There’s also a pair of sliders on challah buns, a choice between crab cakes with tarragon tartar and kohlrabi slaw ($18) or Kobe beef ($16). We moseyed over to “Produce” to share the Charred Caesar Salad ($16), a deconstructed “entree salad.” It’s a whole head of Romaine, outer leaves singed and topped with blackened grilled chicken with dressing dribbled in and around the stalks, while Parmesan encrusted croissant trumped the usual crouton. As a serious seafood house, Hook & Barrel offers a lineup of fresh filets that have made the grade of staff Head Fish Cutter, Tom Mullally. 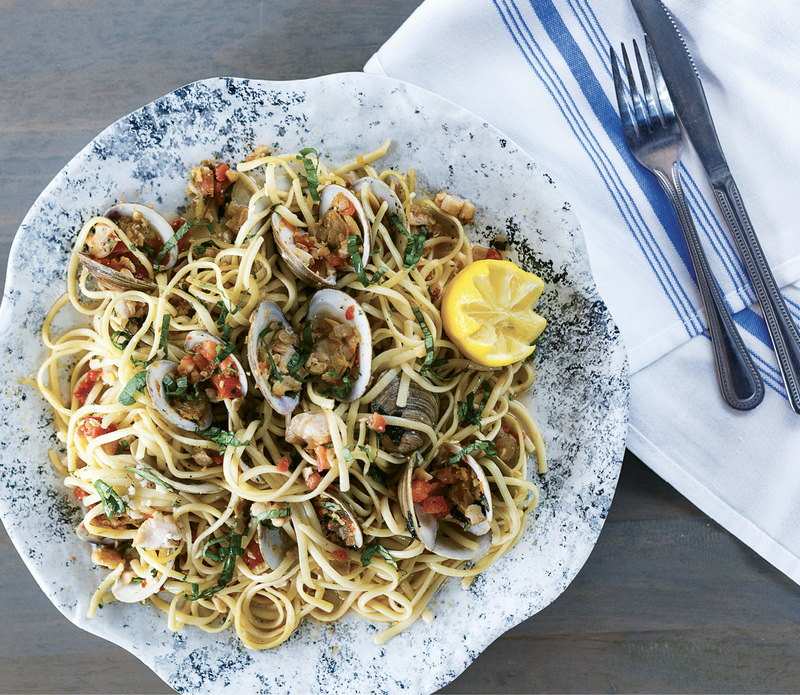 You will readily recognize salmon, swordfish or mahi-mahi, but unexpected surprises pop up, like the delicate saltwater croaker, corvina or a rose snapper. You can have it baked, grilled, pan-seared or blackened and dressed with jicama mango salsa, white wine and butter sauce, Mediterranean-style or with pesto cream. As tempting as the filets were, we could not resist the lobster tails chef’s special of the night ($38), one for each of us with two house-made sides, a tough choice, but Brussels sprouts and mac and cheese won out. Enticing Entrees: Clockwise from top left: The deconstructed Charred Caesar Salad redefines the classic toss with whole heads of Romaine and Parmesan croissant croutons; pork tenderloin topped with a Carolina peach and bourbon glaze; and a house pasta favorite, Angry Clams, featuring Bull’s Bay clams, cherry bomb peppers and basil over linguine. A Hook & Barrel showstopper is the “Myrtle Beach Paella for 2,” an aromatic riff on the Spanish classic that pulls inspiration from the Grand Strand with clams, shrimp, scallops, crab, chicken and andouille sausage in a tomato-vegetable broth over our very own Carolina gold rice ($40). 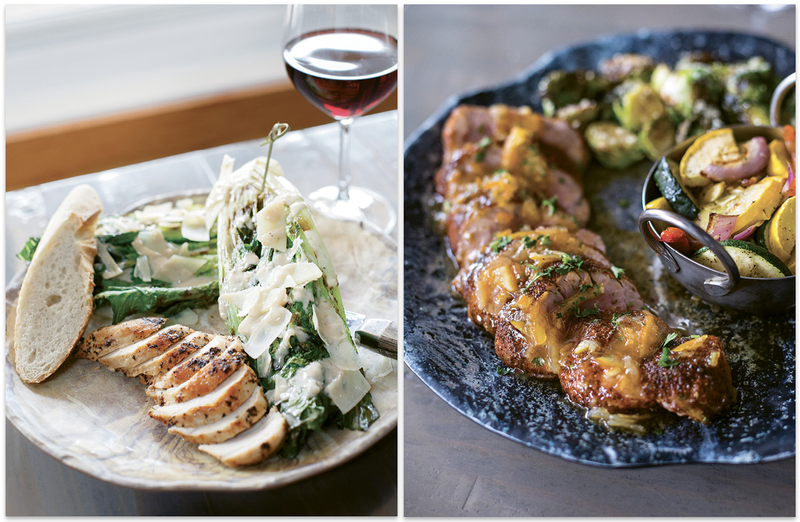 Rounding out dinner options are pasta dishes ($16–$22), pork tenderloin with a Carolina peach and bourbon glaze ($24), chicken stuffed with Boursin cheese, prosciutto and sun-dried tomatoes ($22), a 12-ounce ribeye ($32) and filet mignon. For breakfast lovers who want to steer a little off the beaten path of bacon and eggs, Hook & Barrel serves Sunday brunch with notable twists like smoked salmon rolls and dill lavash ($14), avocado toast with grilled pineapple and pico de gallo ($10), a roster of savory benedicts, and even a bison burger incorporating a fried egg, Benton’s bacon and pepperjack cheese ($16). Hook & Barrel offers an extensive selection of beer, wine, liquor and cocktails, plus another menu devoted to happy hours in the bar area and patio. 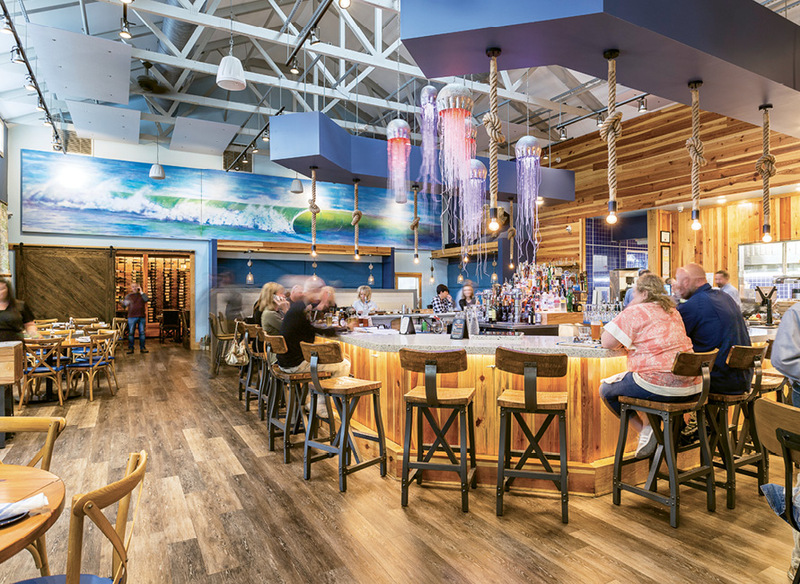 You won’t get off the hook for price here, but if you have a group that wants to experience the best of local seafood cuisine and you want to do it in Myrtle Beach proper, Hook & Barrel is a go-to spot.